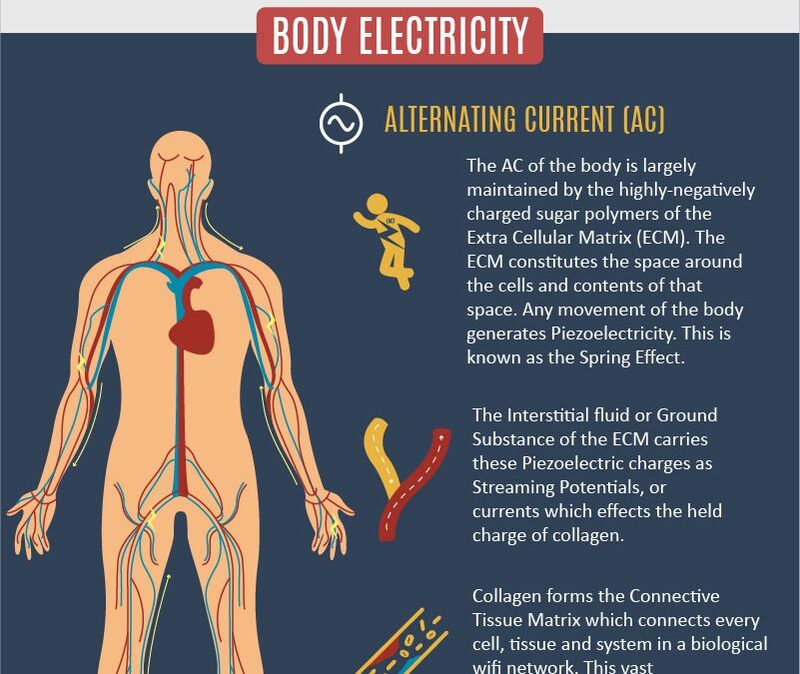 The AC of the body is largely maintained by the highly negatively charged sugar polymers of the Extra Cellular Matrix (ECM). The ECM constitutes the space around the cells and contents of that space. Any movement of the body generates Piezoelectricity. This is known as the Spring Effect. The Interstitial fluid or Ground Substance of the ECM carries these Piezoelectric charges as Streaming Potentials, or currents which affects the held charge of collagen. Collagen forms the Connective Tissue Matrix, which connects every cell, tissue and system in a biological wifi network. This vase communication network is separate to the central nervous system. The DC of the body is associated with the Perineural cells of the central nervous system (CNS). The Perineural system is the connective tissue network of the CNS. In the peripheral nervous system, the DC is associated with Schwann cells, which produce the Myelin that surrounds nerves. The DC forms a strong positive charge around the head and spinal cord, which, when awake, flows from back to front across the brain and reverses during sleep. The actual charge of the DC is not generated by the CNS, but comes directly from the micro-pulsations of the Earth’s magnetic fields, called the Schumann Resonance. All proteins of the body utilise the DC via a process called semi-conduction, to drive regeneration of tissues and processes of remodelling. ECC occurs between neurons, the primary cells of the central nervous system. For one neuron to communicate with the next, it has to be Excited or Uninhibited to fire its Action Potential, which is its Electromechanical message. This activation or inhibition generates an electrical impulse which stimulates the release of chemicals called Neurotransmitters and Neuropeptides. Neurons fire in response to sensory inputs from the environment, such as odours, touch, or light. This constitutes ascending sensory information to the brain. They also fire to control the organs, muscles and systems of the body as sensory-motor outputs. This constitutes descending control from the brain to the body. It is the ECC of neurons which provides us with our experience of life. However, the ECC system is not as far reaching as the AC and DC systems. The nervous system reads and responds to the DC and ACs.